So she's heavenly. We ALL knew that. But is she ready to take her Angel show on the road? If you're suiting her up for costume fun, what better way to bring out her sweet side than by indulging it with this adorable Angelic Miss costume! With a style that looks straight from heaven, she'll be ready to sing in a chorus on high, and to start stringing that harp! So your toddler might be a little young to play the harp or learn all the words to your favorite hymn. But that's no reason not to let her take part in the big church performance or Halloween costume party with this sweet look! An all polyester gown has draped lace sleeves and features a lace cowl for heavenly class, the dress fits with an elastic waistband and the golden sash secures around her waist for an additional touch. Wire frame wings secure to her back with elastic straps, and while we don't think she's going to be flying any time soon, she's sure to have the appearance of a sweet babe who just flew down from heaven. Coordinate her look with sisters for a group theme or use this costume to get her a part in the big play. 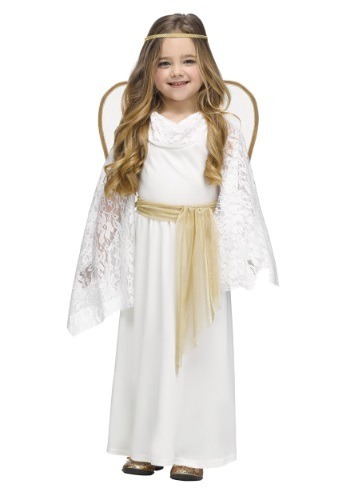 In toddler sizes 2T and 4T, we're sure she's going to fit in very nicely with her new angel crew!